I use Michael Tsai’s outstanding SpamSieve on my Mac to control e-mail spam. Based on the training I give the program, it actively and automagically sorts spam into a designated folder, leaving my inbox pristine and filled only with the e-mail I want to receive. Now, what to do with all that spam collecting in that aforementioned designated folder? Most folks would simply delete it all, and too bad if something found its way there that shouldn’t be. Some folks, myself included, would give it a quick going-over, to make sure their spam-filtering software hadn’t flagged a false positive: a “good” e-mail inadvertently labeled “bad”. And an enterprising fiction writer would tap this new-found wealth for character names. So I created a new text document in BBEdit, gave it the oh-so-original title of “character names.txt”, and starting dumping in names from my spam e-mails. I’m not sure how many pieces of spam I went through, or how long I did this, but the current document has 456 different names in it. And by virtue of receiving upwards of 5,000-plus spam e-mails a week, I always have a ready source for more names if I need them. So skip those fancy character-naming programs, fiction writers. You’ve got a wealth of names right there in your e-mail client. In other words, you don’t know what the children of today are capable of tomorrow, how God may use someone like me, someone like you, now to change the lives of scores, hundreds, thousands, possibly millions, years from now, just because we help change the life of one child today. Please consider sponsoring a child. 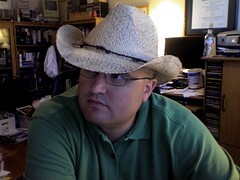 In preparation for the mission trip I’m going on next week to build houses in Juarez, Mexico, I picked up a Panama Jack cowboy hat at Wal-Mart earlier this evening for a mere ten dollars. I was a little miffed to learn the Rangers offer a downloadable calendar for the season, only as a comma-separated .csv file. This is fine and dandy if you’re running Outlook, as apparently the Rangers front office does, but it’s not so good if you’re one of the millions of people–and trust me, there are millions–not running Outlook. Simply unzip (decompress) the downloaded file, and follow your calendar of choice’s method for importing a calendar. The .ics format is an open standard, so pretty much any modern calendar app–yes, including Outlook–will read it. Megan pulled a three-ring binder out of her bag and showed me a photograph of herself and her husband. Young–they’re both 21–with big smiles on their faces and obviously wildly in love. “That’s what he looked like,” she said with a somber face, “He was such a cutie-pie, always buying me little stuffed animals and writing the most thoughtful notes the entire time he was in Iraq.” Then she showed me the photo of her husband receiving the Purple Heart on Wednesday from President Bush at Bethesda Naval Medical Center. As President Bush pinned the medal on Mike, he lay unconscious in the ICU, having suffered a traumatic brain injury caused by a piece of shrapnel that pierced his temple. “This is my Mike now,” she said, rubbing her eyes. He is completely blind and to alleviate a terrible cranial pressure build-up, doctors had to remove the front of his skull. Since being wounded several months ago, Mike has never regained consciousness and suffers from terrible seizures. “That’s my guy,” she repeated, before she went on to tell me about how they met and fell in love. For whatever reason, I kept thinking about the fact that some person somewhere carefully assembled the IED that would eventually maim Mike and many others. They are often packed with nails, hunks of lead and screws to cause maxim human suffering. When they explode, the contents rip through flesh and bones, shattering countless dreams in the process. How to comprehend this level of evil and the physical and emotional agony it causes? This young woman and her husband should be out buying their first Christmas tree together, going to parties, raising a glass to their future. When I asked what she was doing for the holiday she said, “I’ll be here with Mike. I would never want him to be alone on Christmas.” They had been married for about three months when Mike was wounded. In these days before Christmas, Megan and other military wives and moms gave me a precious gift. They reminded me that true love requires sacrifice–sometimes seemingly unbearable, heart-wrenching sacrifice. They are living out their love in big and small ways. Many have moved thousands of miles to relocate to the hospitals where their husbands, wives, sons, and daughters are being treated. This takes an enormous emotional and financial toll, yet they do it for love. When they are not at the hospital bedsides of their wounded warriors, they sit for hours a day in waiting rooms across the United States, hoping for good news–or at least no more bad news. They pray with each other, cry with each other, and yes, even manage to laugh with each other as they hope for a day when they can return to “normal life.” Yet for the families of our most seriously injured troops, they know they will have to get used to a “new normal,” much different from the life they knew before. As we are about to celebrate Christmas spending time with our families and friends, let us all do our best to live up to the true spirit of this season–and make it a time filled with love, faith, gratitude, hope, charity, and, yes, let’s try for some peace on earth. Let us remember the military families and our wounded heroes who will spend this Christmas at Walter Reed Army Medical Center, Brooke Army Medical Center, Bethesda Naval Medical Center and other medical facilities across the nation. As we rush around stressed out because we “haven’t found the perfect gift” for so-and-so, these families hope and pray for gifts that cannot be wrapped up: a hand that squeezes back, a smile, the first step on a new prosthesis, or a positive medical report. They need our prayers and support at Christmas and every day. Please give what you can to any of the wonderful organizations that support our bravest and their families. Well, dear readers, after being gone for a week on a family vacation, I’m now leaving in the wee morning hours–in six hours, to be precise–on a mission trip to Juarez, Mexico. It’s an annual thing our church does, and this year I decided to go as one of the adult volunteers. It’s really a mission trip for the youth of the church, with something around a 65-35 breakdown of youth to adults. Normally the trip is to build simple homes for the poor of the area, but this year we’ve been asked by the mission sponsor, Amor Ministries, to build some duplex housing for attendees of the local Bible college. So you won’t be seeing any updates from the phisch bowl for a bit, as we will have little power available, little running water (which we don’t drink any way, we bring our own drinking water), and absolutely no Internet access of any kind. Mobile phone coverage is even spotty, and insanely expensive. I’m not sure if there’s anything to the fact that as George Thorogood’s “Who Do You Love?” was playing, I came across Steve’s great poem, “my convenient social gospel”, but regardless, it’s a good poem. Thanks, Steve! Okay, campers, we’re in the home stretch, and I’m way behind. As we all know, my wife has the high-earning friends, so with just a few people, she can rack up quite a lot of donations. That means that I need a lot of you to donate to the March of Dimes for this year’s WalkAmerica. I’m $195 short of the goal of $400 I set to raise this year, and about $350 behind my beloved. While it would be nice, in the spirit of our loving competition, to catch up to her, I’d be pleased if I were just able to reach the $400 goal. Five hundred thousand babies are born prematurely in the United States each year, and the March of Dimes is at the forefront of research that helps many of them survive. Our son was among that number in 2003, so we know firsthand the good things this organization does, and this is why we participate each year in WalkAmerica. My deepest thanks to those of you who have already donated, and for those readers who have not, please consider a donation before this Wednesday, the 18th. The walk is next Saturday, the 21st. Thanks, all! Well, well, well. The cat is out of the bag. I told you it might not be long. So the missus calls me while Brent and I are still at lunch, and in the course of the conversation informs me I’m “busted”, that she’s activated her WalkAmerica site, and she’s already started emailing her friends. Now, you have to understand the different circles my wife and I run in. She’s an attorney (pipe down there in the back; it’s corporate law, not ambulance chasing or class-action cannibalism), so naturally a lot of her friends are attorneys, which, as a group, tend toward the wealthier side of the populace. I, on the other hand, am unemployed. You can see where I’m going with this, can’t you? Given my past, most of my friends tend to be in the IT and creative fields, or in some sort of service area, and thusly, as a group, tend toward the less-wealthier side of the populace. Thus, I have to make up for this disparity in numbers of donators, and would appreciate all the help I can get. To top it all off, that minx I’m married to set her goal forty bucks above mine!